The twenty-one trilingual historical markers (Spanish, French and English) celebrate the unique heritage of Iberia Parish and designate significant historic buildings in New Iberia. These markers replace original markers which were presented by the original members of Iberia Cultural Resources Association in its early years. 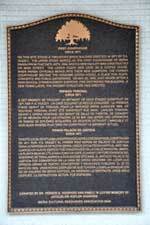 On November 16, 2008, seven of the original nine markers as well as two new ones were dedicated and presented to the City. Each of these markers was funded by individual families in memory of their loved ones. 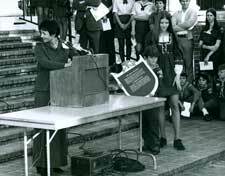 A new group of twelve historical markers was dedicated on Sunday, November 18, 2012. The following list includes those markers which were dedicated in 2008 and 2012. If you are interested in funding one of the new set of trilingual markers which we are currently researching, contact Cathy Indest at 3641603. The Weeks’ Grove – circa 1902 - Located at 320 East Main Street. Donated in loving memory of Donald and Marie L. Delcambre. The United States Post Office – circa 1903 - Located at 300 East Main Street. Donated by Jules Anthony Schwing and Barbara Goodwin Schwing in loving memory of Jules Blanchet Schwing and Marie Louise Landry Schwing. The Murray Building – circa 1900 - Located at 211 East Main Street. Donated in loving memory of Jacob Segura Landry and Stephanie Durand Landry. First Courthouse – circa 1871 - Located at 201 East Main Street. Donated by Dr. Vernon A. Voorhies and family in loving memory of Jacqueline Kofler Voorhies. The Dreyfus Building – circa 1880 - Located at 131 East Main Street. Donated in loving memory by the family of Mayor J. Allen Daigre and Hildarose Guidry Daigre. The Great Fire – circa 1899 - Located at 116 East Main Street. Donated by the family of Harold and Josephine Wormser in loving memory of Mr. and Mrs. Henry Frosh and Mr. and Mrs. Justin Wormser. The Steamboat Era – circa 1830-1943 - Located at 101 East Main Street. Donated by the Kyle Family in loving memory of Virginia Kyle Hine and Captain William Thomson Kyle. The Gouguenheim Building – circa 1890 - Located at 101 West Main Street. Donated by the George J. Trappey Family in loving memory of Barbara Tomlinson Trappey. The Erath Building – circa 1884 - Located at 335 West St. Peter Street. Donated by the great-grandchildren of August Erath in loving memory of the Erath and Kramer Families. Bazus Building – circa 1880 – Located at 210 East Main Street. Donated by Aline Compton Porter in loving memory of Frances Maumus Compton. Church Alley – circa 1837 – Located between 114 and 120 East Main Street. Donated in loving memory of Milton “Maney” Joseph Belanger, Jr. and Laura Borel Belanger by their children Cindy, Phyllis, and Bo. The Davis Building – circa 1892 – Located at 133 East Main Street. Donated by Dr. Donald J. Voorhies and the children of his siblings, Dr. Cornelius P. Voorhies, Jr., H. Alfred Voorhies, and Diane Voorhies Plaisance in memory of Cornelius P. Voorhies, Sr. and Odette Delcambre Voorhies. Evangeline Theatre – circa 1930 – Located at 129 East Main Street. Donated in loving memory of Harry John Broussard and Joyce Dugas Broussard by their children Donna, Simone and Kerry. Grotto of Our Lady of Lourdes – circa 1941 - Located at 445 East Main Street. Donated in loving memory of their parents by the children of William Joseph Trappey and Cleo Viator Trappey. Iberia Parish Court Building – circa 1940 – Located at 300 South Iberia Street. Donated by the Iberia Parish Government in honor of the Citizens of Iberia Parish. Provost’s Café and Bar/Clementine Fine Dining and Spirits – circa 1890 – Located at 113 East Main Street. Donated in loving memory of their parents by the children of Dr. Vernon A. Voorhies and Jacqueline Kofler Voorhies. Saint Peter’s College – circa 1918 – Located at 445 East Main Street. Donated by the Conrad family in loving memory of Glenn R. Conrad, New Iberia author and historian. Segura – LeBourgeois Building – circa 1885 – Located at 204 East Main Street. Donated by Chris and Becky Jordan in loving memory of Alton Terry Jordan and Curtis Jordan, Sr.
Sugar Cane Festival and Fair Building – circa 1951 – Located at 600 Parkview Drive. Donated by the Iberia Parish Government in honor of the Citizens of Iberia Parish. Veterans Memorial Building – circa 1949 – Located at 500 Marie Street. Donated by the Iberia Parish Government in honor of the Citizens of Iberia Parish. Wormser’s Department Store Buildings – circa 1932 – Located at 114 East Main Street. Lovingly donated in honor of their parents by the children of Roy Eldridge Indest, Sr. and Joyce Babineaux Indest. 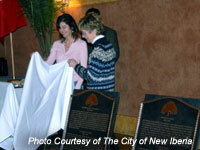 In order to purchase a marker in memory of a loved one, call Cathy Indest at 364-1603 or email info@iberiacultural.org. Approximate price of each marker is $3,800.00. 312 Marie Street | New Iberia, LA 70563 | Phone (337) 364-1603 | info@iberiacultural.org | ©Iberia Cultural Resources Association, Inc.